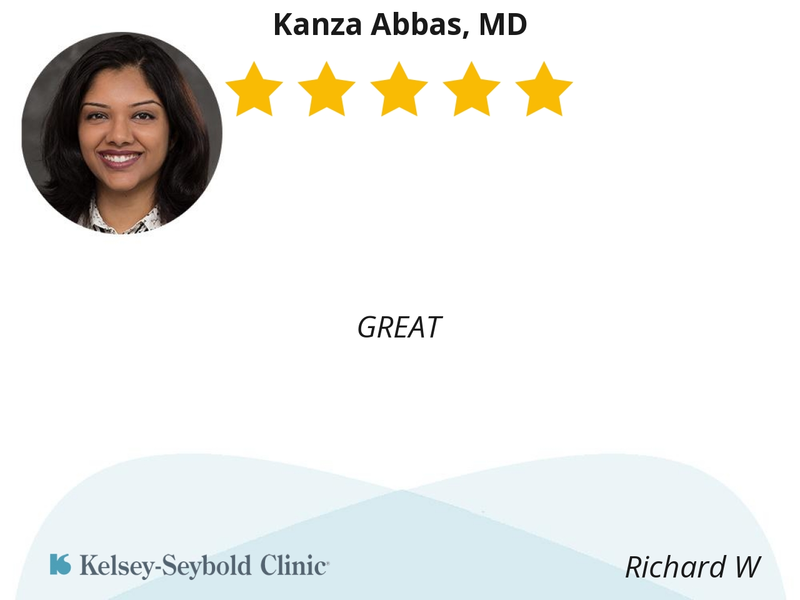 A specialist in Hematology and Oncology, Dr. Kanza specializes in the diagnosis and treatment of blood diseases and cancers. She is very attentive and caring. She takes time to address my concerns. She is an excellent Doctor. this may be a duplication? She came highly recommended. She goes over my charts with explanations. Seems sincere in prevention and care. Friendly, courteous and other attributes you want to have in caring for you. She honest and explains your concerns in detail. She is awesome. She was very kind from the moment I walked in. Gave me her honest opinion about my case and what she recommends as far as a treatment plan. Answered all of my questions and made me feel very comfortable. Dr Abbas is a very caring knowledgeable doctor. I recommend her. Very caring and excellent Dr.
Great bedside manner. Sincerely honest. she takes the time to fully answer all your questions. Dr. Abbas is the best. She projects high intellect, strong analytical skills, extensive training wrapped in compassionate and caring patient care. She patiently answers my stupid questions, carefully discussing treatments issues and options with humble empathy. Her comforting humanity is her Superpower. She makes me feel that I am receiving the best possible care, advice and attention while fighting my cancer. I found Dr. Kanza Abbas to be the most caring and concerned of any I have met to this day. She described my condition to me at some great detail and described what treatments were available to me. I look forward to working with her and have every confidence in her suggestions for my cure. I cannot speak more highly of her. I believe she is greatly intelligent and caring.